Despite saying it would get a handle on its coal exports, Indonesia is still causing a price-crushing glut. Indonesia says the right things, but so far it hasn't been able to get a handle on its production. That's keeping the export market weak, with notable implications for coal miners like Peabody Energy and Alpha Natural Resources. Indonesia roughly doubled its coal exports in the five years leading up to 2012. It's coal has mostly gone to China, which uses vast amounts of the fuel to feed its electric utility fleet and steel mills. However, this flood of coal has left the global coal market oversupplied. That, in turn, has left prices weak. For example, globally diversified Peabody Energy has seen the prices it gets for its Australian coal, which primarily goes to Asia, fall from an average of around $122 a ton in 2011 to just under $75 a ton in the first quarter. Those numbers average met coal in with thermal, but the steep downward price trend is clear. Peabody Energy can only cut costs so much to make up for this magnitude of price weakness. In fact, in the first quarter, the company's gross margin was just $0.22 a ton in Australia. Compare that to 2011, when the miner's gross margin per ton there averaged $47.21. 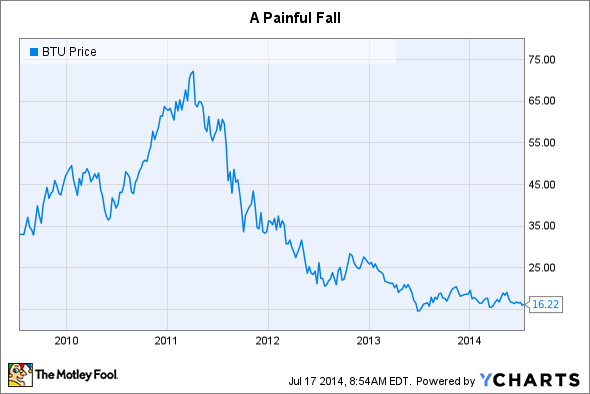 It's no wonder that Peabody Energy shares are down so much from their early 2011 highs. That's where Indonesia is continuing to make life hard. After discussing efforts to curtail production earlier this year, the archipelago increased production nearly 8% year-over-year in the first half. It's on pace to export over 425 million tons after claiming it would limit exports to 400 million tons. You also have to add in the illegal exports that take place, which are estimated at around 50 million tons. Indonesia's massive exports take on even larger proportions because they impact the global trade of coal, not just trade with China or coal from Australia. For example, Alpha Natural Resources mines for coal in the United States, but exported over 20% of its output across the globe. Although Alpha Natural Resources is a domestic miner, it's clearly a global coal player. In fact, Alpha Natural Resources alone accounted for just over 15% of U.S. coal exports last year. Anything that hurts global coal prices also hurts Alpha Natural Resources. Adding insult to injury, many coal exporters have seen the value of their currencies fall relative to the dollar, making U.S. coal relatively more expensive. That actually helped Peabody Energy's Aussie business, as hard as that is to believe, but was nothing but a damper on Alpha Natural Resources. Unfortunately for Peabody Energy and Alpha Natural Resources, there's little they can do to curtail Indonesia's coal exports. However, like so many other miners, this pair is working to reduce costs, including shuttering higher-cost mines. That takes volume out of the global coal trade. Curtailing production only helps if someone else doesn't increase production to make up for the shortfall, though. That "someone" is currently Indonesia. Since the country is the world's largest coal exporter, sending roughly 75% of what it mines overseas, it has a disproportionate impact on the seaborne coal trade. In other words, you need to keep an eye open for news about Indonesia and its coal exports. Right now, this is a key driver of coal prices. That said, Alpha Natural Resources highlights that there are nearly 1,200 coal plants on the drawing board around the world. Asia accounts for nearly 90% of the projects. Peabody Energy expects such demand to lead to an increase in the coal trade of nearly 50% by 2030. Even if Indonesia keeps exporting, demand will likely catch up with supply eventually. Indonesia could simply be providing you with a good buying opportunity for miners like Peabody Energy and Alpha Natural Resources—if you can stomach the ongoing price downturn.